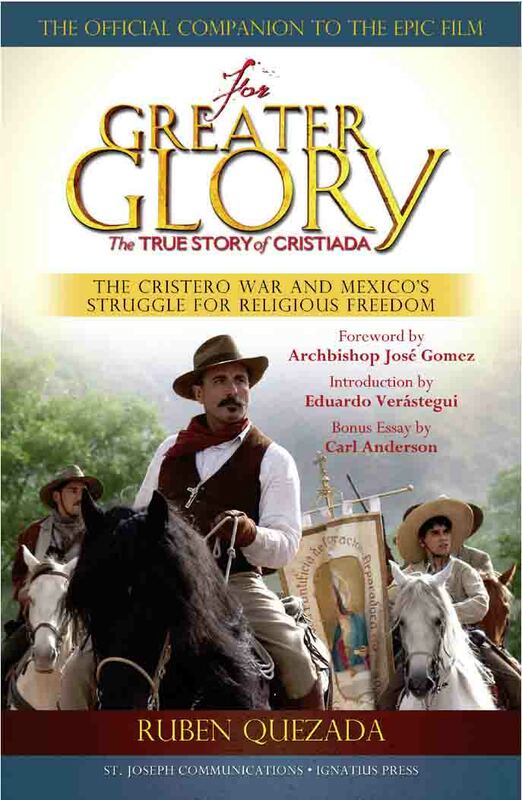 The movie, For Greater Glory, accurately depicts the Mexican governments persecution of the Catholic Church in the 1920's. Great acting by award winning actors. True History that is often ignored. This is not just another Hollywood movie. It is a spiritual journey. Print out a Free Pamphlet on this movie and resources stated here. 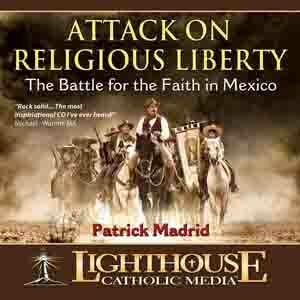 Purchase Lighthouse CD, Patrick Madrid’s talk. This article is comprised of excerpts from Columbia magazine May 2012. Copied with permission from Knights of Columbus, New Haven Connecticut. These articles set the record straight, both as to the real cause of the violence and the peaceful efforts of the Knights of Columbus on both sides of the border to defend religious liberty in Mexico. The persecution of the Catholic Church in Mexico began when the administration of Mexican President Plutarco Calles took punitive measures to silence priests and bishops, confiscate Church property and close Catholic schools. When the archbishop of Mexico City spoke out against such measures, his residence and the chapel of Our Lady of Guadalupe were bombed. 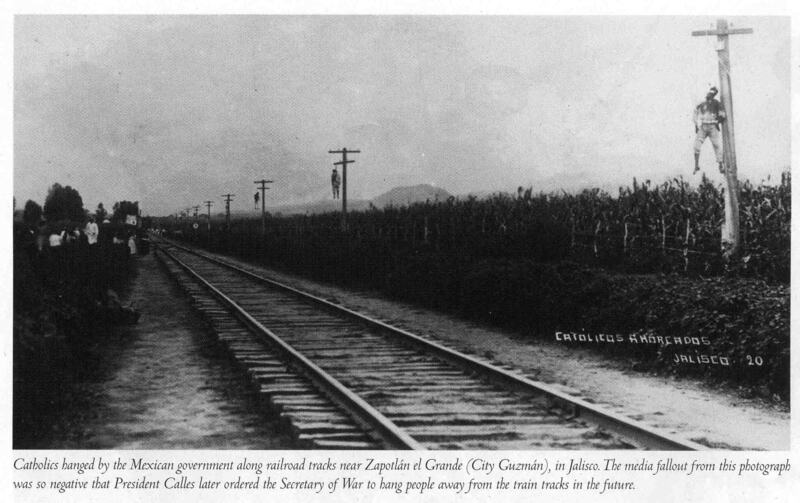 Catholics hanged by the Mexican government along railroad tracks near Zapotlán el Grande (City Guzmán), in Jalisco. The media fallout from this photograph was so negative that President Calles later ordered the Secretary of War to hang people away from the train tracks in the future. Indeed, thousands of Mexican Knights sacrificed much for religious liberty. Many lost their lives, and some of these martyrs — both laymen and priests — have been beatified or canonized by Pope John Paul II and Pope Benedict XVI. Today in the United States, it is impossible to recall these events without thinking of current threats to religious liberty, including the Obama administration’s insistence that contraceptives, sterilization and abortion-inducing drugs be included in the health insurance programs of Catholic organizations. This federal mandate is backed by the threat of millions of dollars in fines if Catholic organizations refuse to comply as a matter of conscience. Cardinal Francis E. George, the past president of the bishops’ conference, has concluded from the intransigence of the Obama administration that it wants Catholics to “give up” our schools, hospitals and charitable ministries. “Today we send a message to Calles, and to the world,” he says. The battle they are about to face will be one of many during the Cristero War, a conflict that lasted from 1926 to 1929. This often forgotten era of Mexican history is captured in a new film comprised of an ensemble of talented and award-winning actors. But in the small towns and villages, people keep alive the memory of the Mexican martyrs and Cristero heroes through fervent devotion. “We live in a time where religious freedom is as tenuous as it’s ever been,” said Wright. Durán confirmed that he was a Knight and asked whether there was any evil in it. Considering this an indictment, Valle pronounced Durán a “subversive Catholic” and ordered him shot on the spot. Durán’s body was later delivered to his family in a bricklayer’s cart. During this time, the government seized Catholic schools and seminaries, expropriated Church property, and outlawed religious education. It closed Catholic hospitals, orphanages and homes for the elderly. It also banned monastic orders, expelled foreign-born clergy and prohibited public worship. Priests and nuns were barred from wearing religious garments, from voting, and from criticizing the government or commenting on public affairs either in writing or in speech. If charged with a violation of the law, they were, like Durán, often denied a trial. Mexico’s bishops were expelled, and many of the clergy were exiled for years; those who remained or returned in secret were forced to work and minister “underground.” Many seminarians were also exiled to Spain or the United States. Although the Knights as an organization did not provide support to the Cristeros’ military efforts, it remained a target for the Mexican government, explains historian Jean Meyer. According to Meyer, more than 200,000 people from every socioeconomic background were killed or martyred by 1930. On May 21, 2000, Pope John Paul II canonized 25 martyrs — including six Knights — from the Cristiada period. Thirteen more Mexican martyrs — including three Knights — were beatified in Guadalajara, Mexico, on the Solemnity of Christ the King on Nov. 20, 2005. “¡Viva Cristo Rey! ¡Viva la Virgen de Guadalupe! 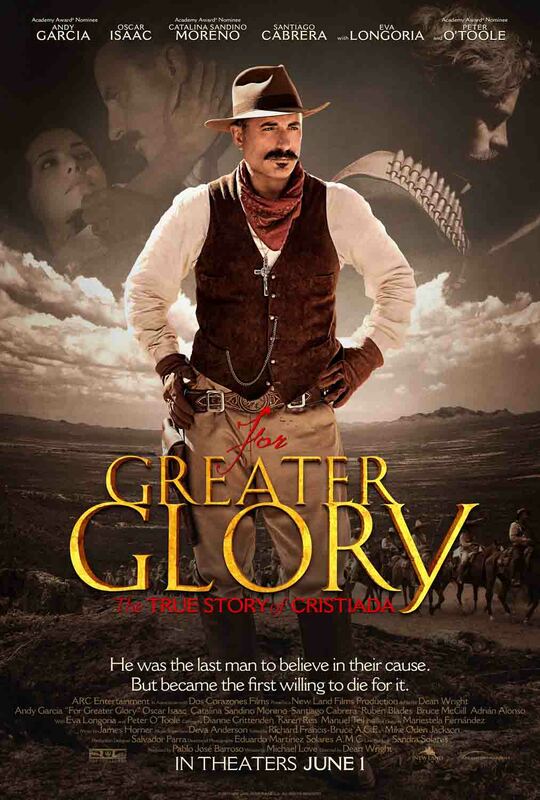 The movie also contains occasional moments of humor and, largely through exchanges between General Gorostieta and various other characters, the movie acts as a kind of catechesis by explaining the importance and meaning of the Christian faith. This movie is rated "R" for violence. It is about a terrible war against Christianity in Mexico. The amount of violence is well chosen. It is definitely real, but not grisly or grotesque. The violence factor helps a person appreciate how much these martyrs sacrificed and how strong their faith was. The movie is well directed so that the viewer could see beyond the suffering to see the love, the faith, the valor, and the integrity of those being killed just because they wanted to love Jesus. They were called "Cristeros" because of their battle cry "Viva Cristo Rey." This movie is truly inspiring! After having seen it, my petty complaints about life being unfair seemed only a trifle. Does this movie glorify war ? No! Definitely not. In fact, I would say it offers us the best hope of avoiding war. Read more ... also read about confusing "Train Incident." You might have to right click on image to bring up the “print” option. just after celebrating the outlawed Holy Sacrifice of the Mass in 1927. Blessed Padre Pro died in a similar way. See a list of martyrs such as Cristóbal, or Christopher, Magallanes. Download Free PowerPoint to promote movie. 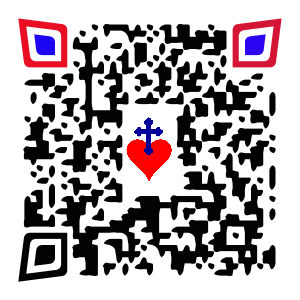 Scanning the QR Code above containing the heart and cross logo with a smart phone opens up this web page. This web site article is comprised of excerpts from Columbia magazine May 2012. Copied with permission from Knights of Columbus, New Haven Connecticut. 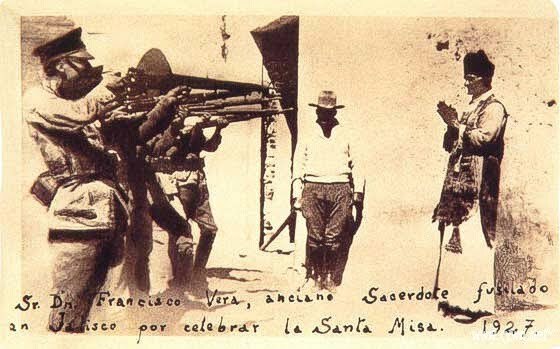 Rejecting the traditional blindfold, Miguel stretched his arms out in the form of a cross and facing the firing squad said, "May God have mercy on you. May God bless you. Lord, You know that I am innocent. With all my heart I forgive my enemies." External links to other web sites :Blessed Miguel Pro, S.J. Mexico's Merry Martyr - Free short video on biography of Blessed Miguel Pro, S.J. 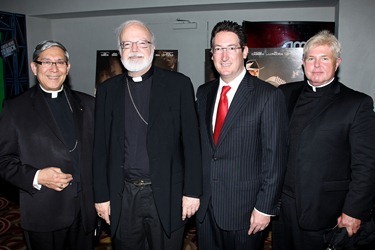 Archbishop Chaput’s comments about the film.